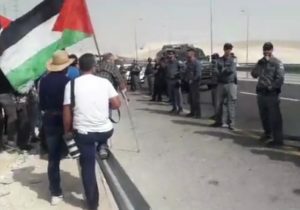 Israeli soldiers resorted, Friday, to the excessive use of force against dozens of Palestinian, international and Israeli peace activists, holding a nonviolent procession in the al-Khan al-Ahmar Palestinian Bedouin community, east of occupied Jerusalem, wounding ten, and abducted one after injuring him. Medical sources said the soldiers physically assaulted the nonviolent protesters, in addition to spraying with gas and pepper-spray. 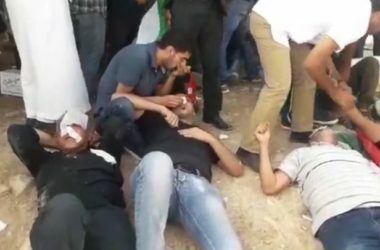 They added that the attack led to at least ten injuries, including five who were rushed to Palestinian hospitals after suffering burns, cuts and bruises, in addition to the severe effects of teargas inhalation. Furthermore, the soldiers assaulted and injured a Palestinian, identified as Tha’er Shawabka, before abducting him. Palestinian Legislator and the Secretary General of the Palestinian National Initiative, Dr. Mustafa Barghouthi, said the escalating Israeli attacks against the nonviolent protesters will only boost the steadfastness and determination of the residents and activists. Al-Khan al-Ahmar village is made up of around 180 members of the Jahalin Bedouin tribe, which has a 70-year-long history of dispossession and forced relocation by the Israeli government.